The University Of Lahore getting attention from educationalists as its achieved high ranks in sector and also ranked in world's 500 universities and got 'W' category by HEC. That is what they are publishing on their marketing medias. I agreed that no doubt they have reached on a high place but there are some reasons behind that. First reasons is that they were operating in this sector in collaboration with Hamdard University but few years ago they changed their name as the result of their disputes with Hamdard University on high collaboration contract renewal fee. So when they changed their name to University of Lahore they already got a proper setup and students. So when international organizations measure the growth UOL they measure their progress in five years and shocked to see a university doing this much growth. Another reason for there popularity is that they are offering everything, Yes ask for medical, engineering, business, commerce, pharmacy I mean everything. Accredited by the Pakistan Engineering Council, Pakistan Medical and Dental Council and The Pharmacy Council of Pakistan and W rank from HEC sounds like woOww. But let me tell you the inner side of picture, the most important factor for any educational institute is its teaching. So I have discussed with some students of UOL about their teachers and their teaching methods. The response was not satisfactory for me and wasn't near all the ratings and rankings they have got. You will read detail of my conversation with a student in "Student Talk" section. With new campus near COMSATS they might get more attention but the ting is standard of education. They have to pull is up to meet the real competitors in Education Industry. Okay now have some quick review of different aspects of University Of Lahore. HISTORY: History of University Of Lahore is not much old but they operated as Hamdard University for a longer period of time. 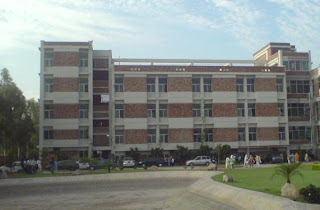 BASIC INFORMATION: With their main campus at Thokar Niaz Baig Lahore and newly build campus near COMSATS they are offering wide range in fact almost every degree which is available in Pakistan. Medical, Engineering, Business, Commerce, Pharmacy, Sciences etc. they have it all. Currently admissions are in progress in some departments. STUDENT TALK: I talked to many students of University of Lahore and findout useful information. A student of BBA (hons) Sultan told me about faculty of business administration. He told me that Business Administration faculty is Normal overall but if we take faculty of finance out of it, it might be ranked below average. Teachers are not very much keen of quality. He was satisfied with cafe of new building but not the old one. According to Sultan class rooms are not quit meet the standards and not even enough spacious. FACILITIES: Facilities at UOL are not up to the mark they need to improve their facilities for students. Class rooms are not quit good, cafeteria is normal with reasonable variety and taste, transport service is equal to nothing but lawns are green, overall campus environment is healthy. PROGRAMS OFFERED: UOL is providing a wide range of disciplines you can see all the details of their programs by clicking here. and here. UOL has separated its Business Studies section under the name of Lahore Business School(LBS). LBS is offering following programs. WEBSITE: UOL have very basic website which contains basic information about the institution. Find out more here. Hi I am ex-student of University of Lahore. I have done BCS (Hons) in 2004 and Masters of Accounting and Finance in 2006. Please find below my comments on this subject. 1. None of the institution in Pakistan is self made. If we talk about public universities, govt of Pakistan is supporting them. If we talk about Lums, Syed Babar Ali and almost all multinationals are supporting it. Believe me on this, as I am currently working in a Lahore based multinational company. These multinationals used to give grants in millions and billions every year to Lums. Considering the Pakistani environment I think UOL is doing an excellent job with no govt or MNC support. 2. About facilities I would like to say that when the first time I visited Lums I was not at all surprised with their campus and their facilities considering the amount of money they ask for their programs. 3. About faculty, I would say more you pay more you get. Lums work on exceptionally bright students with minimal effort of teachers. UOL/LBS work on above average students and therefore more effort is required in this case. At the end its student effort which pays him. Atleast UOL/LBS is offering locally and internationally recognised programs within budget of common middle class person. Lums charge more than Rs 10 lakh for its MBA and LBS charge Rs 300,000 to 400,000. Teacher are not loyal to universities; when UOL start giving them more money which Lums is currently offering them, believe me they gonna leave Lums for UOL/LBS . 4. I have seen students of Lums and LSE doing internships in my company; what I have found is that they have good communication skills and nothing more. There was one student who didn’t know about financial reporting standards at all and he was doing MBA Finance (finalist) from Lums. UOL taught me every bit of these standards. Even Chartered Accountants see strangely to me when I comment something very technical which they believe only they know it. Thanks to Maqbool Sb in UOL. Universities supposed to teach professional education; these are not academies to improve English skills only. 5. Lastly, I would like to say that UOL provide us good opportunity to have professional education especially for a middle class person. At the end it’s his efforts, capabilities and luck which keep him rolling. I myself am the best example. That's just awesome.. if you want to join pakistan rishta or read latest urdu sms or want to read beauty tips in urdu?